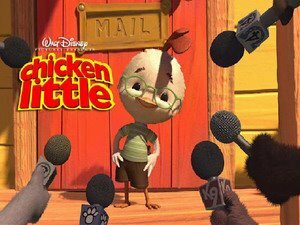 I went to see Chicken Little last night and thought I would give a review in case you're interested in taking your children to see it. Or, you may be interested yourself ... how it stacks up against Disney/Pixar collaborations. As you may or may not know ... this is the first fully computer generated "fairy tale" type story Disney has done with an inhouse animation team. 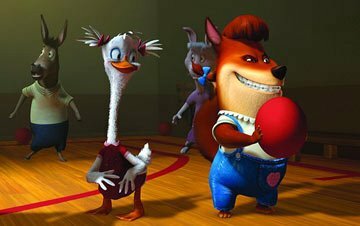 There was a previous attempt in 2000, when Disney released the inhouse production; Dinosaur, but Chicken Little represents a true departure from sole use of Pixar. In fact, I believe many people will think this IS a Pixar film ... and on that note ... I have to say ... I hope not. The humor in the film was more Shrek like; being, "burp and fart joke" oriented. ; instead of clever Warner Brothers-like adult humor and themes that also make children laugh. The animation is also lacking vs a Pixar film. While the characters in Pixar Films look cartoonish, they look believable. (Almost, as if they were in an alternate universe, where people actually look like that.) In Chicken Little; animation looks poorly rendered, pixelated, and "good enough". You can tell that Disney didn't do any "Pixar like" studies of hair or feathers. Hair, feathers, and facial expressions don't match up and have that quick and slow pause that I have always found annoying with computer animation. Here is one example. I thought Foxy Loxy looked like a famous Playstation video game character; Crash Bandicoot. There are some funny elements and the story is decent. It was enough to keep a seemingly loud and obnoxious kid who sat near me; entertained. He only caused two or three outbursts, but was clearly a problem child before the show started. I was worried about how he would talk during the movie. A lot of the elements in the movie were borrowed or lifted from other movies, but still ... it's pieced together well. So ... Disney's attempt was just that, in my opinion ... an attempt. My best friend and I gave it a joint rating of 6.5 out of 10. As for the music, there is one song by Five For Fighting called "All I Know" that was one of the best songs I've heard in a while. And that's all I know"
This is a cover of a 1972 Art Garfunkel Song, but it is MUCH better in this remake! I just saw chicken little. As soon as I heard "all i know" I loved it and wanted the soundtrack asap, not to mention all the oldie but goodies sprinkled throughout the movie. So cute.